Home Archive by Category "Using Your FAB Dock"
Exiting and Entering your FAB Dock only takes a few simple steps to ensure you protect your FAB Dock and your boat. Always make sure you follow each step and you should never have an issue. Like anything the more you look after it the longer it will last. The FAB Dock is designed to make life simple for you and your boating life. Each customer is provided with a guide to keep with them on the boat, the guides are water proof and can attach to your key ring or keep in your wallet. If you loose yours or need another just contact our office and we will post one to you. If you have any questions or unsure of how to enter and exit your FAB Dock then contact one of our Business Partners to discuss it further. Docking your boat can sometimes be quite difficult based on where you are docking, the weather conditions and your experience. 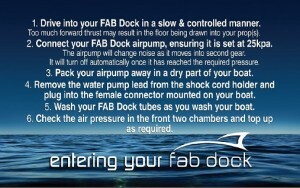 FAB Docks can give you peace of mind all you have to do is thrust forward in a slow and controlled manner and point your bow of your boat into the FAB Dock, the FAB Dock will then push your boat in the right direction. Not only does the FAB Dock save you from any embarrassing docking moments but it also saves your boat from any possible damage by hitting the pontoon or any nearby boats.